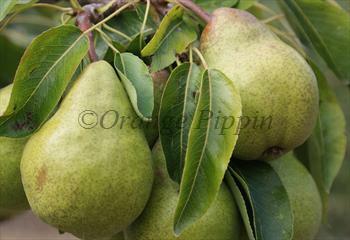 Packham's Triumph is a 19th century Australian pear, which produces abundant crops of well-flavoured golden-green pears. It is hardy and easy to grow, but benefits from a sheltered sunny position. Please fill in the details below and we will let you know when Packham's Triumph pear trees are back in stock. Fruit persistence: Fruit drops when ripe? Packham's Triumph is in flowering group 3. Packham's Triumph is self-sterile and needs to be pollinated by another tree of a different variety nearby. Since it flowers in the middle of the blossom season it can be pollinated by most other pear trees. As might be expected of an Australian pear variety, Packham's Triumph likes a sheltered position, a dry climate, and plenty of sun. If these requirements are met it is easy to grow and a heavy and reliable cropper. Whilst it is usual to pick pears in the UK slightly under-ripe to allow ripening in a fruit bowel, you may want to experiment with letting Packham's Triumph ripen on the tree. Fruit size can be slightly small if the tree is allowed to set too heavy a crop - if this happens, thin the fruitlets in June. Packham's Triumph is particularly suitable for cross-pollination with Josephine de Malines, and also the Asian pear variety Nijisseiki. Packham's Triumph was developed by Charles Packham of Molong, New South Wales, Australia, in the 1890s. Packham was a commercial grower and this was a period of dramatic expansion of the New South Wales orchard industry. The new variety's reliable cropping and good keeping qualities made it an immediate success. Packham's Triumph inherits its flavour from the well-known and high quality Williams Bon Chretien pear, also known as Bartlett. Its other parent is a rare variety called Uvedale's St. Germain which was found in England in the 17th century, although it may have been imported from France. This pear, primarily used as a culinary variety, appears to have contributed long keeping and reliability to the mix.